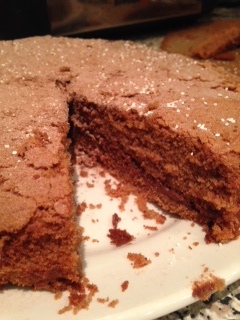 Yesterday I blogged about my attempt at making a gluten free chocolate cake. It all went a bit wonky as my oven shelf tipped as I put the cakes in and I didn’t notice. This meant they were fat one end and thin and biscuit like at the other end. Undeterred, I took them out of the tins and sandwiched them together with chocolate spread. Not a beautiful cake, but an edible one…. Well, this cake doesn’t look pretty, that’s for sure! It is rather crumbly at the edges and completely uneven. However, it does actually taste quite acceptable. Me and DD3 each had a piece. But cake should be scrumptious and delicious, not just acceptable. It has a nice light texture, but is missing something. I think I will attempt it again but this time, instead of adding cocoa powder, I will melt some actual chocolate and mix that in. Hopefully that will solve the crumbling issue and make it taste richer. If that works I might go the whole hog and whip up some cream to add to the filling. I think I need to experiment a lot more! I used the Dove Farm flour that I bought in Sainsbury’s the other day. The recipe for the chocolate cake was on the packet. The only thing I added was some Xanthan gum, since I had it and it is supposed to make gluten free cakes lighter. It is going to be trial and error but hopefully I can find some decent recipes for the basics over time. I had to go to a meeting in Chelmsford today. I knew there would be biscuits which I wouldn’t be able to eat so I bought a gluten free seed bar on the way in. I thought it might be fit for the birds, but actually it was lovely as well as healthy. I will buy one again! If you see these and want a healthy treat, give one a try! Have never heard of the product you added to the gluten free recipe. Very interesting. Nor would I have thought to use some chocolate instead of the cocoa. You are good at experimenting. I have had a good look at the BWY website – thanks for the recommendation. I am not sure which is the best route for me to take (once I have saved up enough money!) I wondered if you would mind sharing the route you took to become a yoga instructor – either here or via email – as I am keen to take the most cost efficient route and not have qualifications that overlap. Also how often do you have to practise to keep yourself flexible enough to keep teaching classes. I have a wonderful yoga teacher, but I feel too embarrassed to ask her advice about training in case she laughs her head off at the very thought, which is unfair of me as she is far too kind! Sorry to take up your time again.